After releasing three high-definition camcorders earlier this year with integrated GPS services from Navteq, Sony today announced two smaller, flash-drive-based additions to its GPS camcorder arsenal. The AVCHD-recording Sony Handycam HDR-CX520V (64GB) and the Sony Handycam HDR-CX500V (32GB) will both be available in September. The higher-capacity HDR-CX520V is expected to sell for $1300; the HDR-CX500V will cost a bit less, $1100. Sony says both cameras will record 1920-by-1080-resolution full HD video, and both models will be able to convert in-camera AVCHD footage to super-smooth 60p video for outputting to an HDTV via HDMI cable. The new camcorders will also be able to down-convert AVCHD video to MPEG-2 video, which means they'll work better for DVD burning than most AVCHD camcorders. In addition to the GPS capabilities, which lets users geotag and embed video on a map interface, the new flash-drive camcorders offer the same Sony G Lens as the hard-drive-based models released earlier this year, plus a fine-tuned optical image stabilization system that the company says is more effective than previous versions, and a simplified touchscreen interface to ease in-camera navigation. Also new is the camcorders' Face Touch mode, which lets users select a single face on the camcorders' LCD screen to optimize focus and exposure settings. Face Touch mode also triggers the camcorders' Smile Shutter mode, which lets users automatically capture a 12-megapixel image as soon as the selected subject smiles. Smile Shutter can also be set to capture still photos while the camcorders are shooting video. Both models also feature Sony's recently revamped Exmor-R CMOS sensor, which the company says captures sharper fringes and better low-light footage. A 12X optical zoom, a 3-inch-diagonal touchscreen LCD, and 5.1-surround-sound microphones round out the new camcorders' hardware specs. 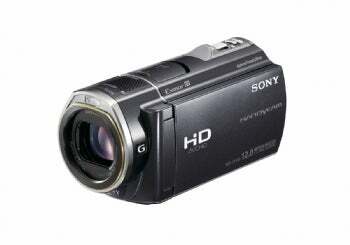 The new Sony camcorders replace the existing Sony Handycam HDR-CX12.